CPO are to be commended for their enterprising ventures in making available music by unknown and unsung composers. Their endeavours in this field have occasionally thrown up a few surprises. I am thinking specifically about their championing of compositions by well known artists whose fame has, in the minds of many, been confined to their performing skills in the concert hall. I have heard very fine music composed by the conductors Felix Weingartner and Bruno Walter. Here we have some compositional offerings by the Austrian pianist Artur Schnabel, who was described by the music critic Harold C. Schonberg as ‘the man who invented Beethoven’. It is ironic that, as a pianist, Schnabel was averse to performing contemporary music, yet his own compositions are firmly set in the modern idiom. He was a musician rather than just a pianist, and he regarded himself primarily as a composer, an area where he could exercise his intellect and probing mind. Besides the works included here, his catalogue includes three symphonies, five string quartets and many smaller compositions. Whilst complex and difficult, they are marked by an originality of style. The Piano Quintet was written in 1915-16 and premiered in Berlin on 2 June 1918 at a benefit concert for German war refugees. After that the manuscript went off the radar, only to re-emerge in 2001. At 54 minutes this a large, loosely-constructed work, bordering on atonality, but having a key signature. Schnabel displays great skill in the instrumental writing. The first movement is orchestral in character. The centre of gravity is the second movement adagio. There is great beauty in the writing but even after repeated listening, I found the various sections rather disjointed and the movement, as a whole, rambling. The character of the third movement is carefree, with dance elements abounding. The Pellegrini-Quartett play with great commitment. The Drei Klavierstücke op.15 (1906) are firmly rooted in tonality. They are exquisitely performed by Irmela Roelcke. I was particularly taken by the third movement four-part waltz. These pieces ought to be taken up more by pianists. Similarly, the Drei Fantasiestücke fur Klavier, Violine und Viola which showcases Schnabel’s melodic gifts. In this Roelcke is joined by Antonio Pellegrini (violin) and Fabio Marano (viola). The captivating third movement ‘Andantino’ is almost ‘salon’ in character, tinged with a sentimentality. In 1923, Schnabel composed his Piano Sonata, one of his most highly original and inventive scores. It is in five movements, for each of which Schnabel gives specific instructions as to its individual character. There are no bar-lines and no key signatures. The tempo is free, and he allows the musical ideas to flow and emerge. Firmly ensconced in atonality, it is dissonant and hard-edged in parts. Once again, Roelcke delivers a captivating performance, and shows clearly that she has a deep love for this music. In the two song-cycles op.11 and op.14, Schnabel sought out texts from popular contemporary poets. Here there is a continuity with the tradition of German romantic lieder, and the influences of Schubert and Brahms can be detected. The alto Sibylle Kamphues offers compelling performances. The artists are to be commended for championing Schnabel’s work. The Siemensvilla Berlin provides an admirable acoustic. The booklet notes are informative and well-written. 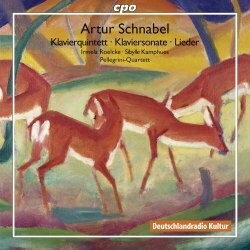 As one who greatly admires Artur Schnabel as a pianist in the works of Beethoven and Schubert, I am grateful that I have had the experience of listening to him as a composer. There is no doubt that there are some good things here. Well worth exploring.